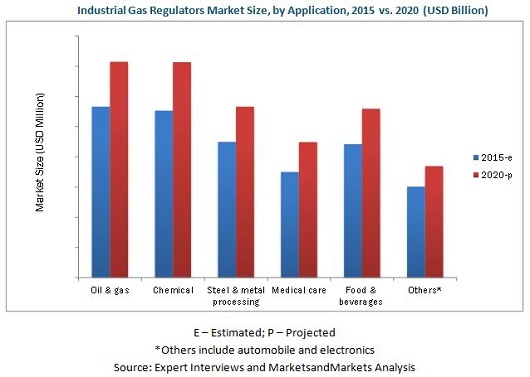 [182 Pages Report] The global industrial gas regulators market was valued at USD 12,770.2 Million in 2014, and is projected to grow at a CAGR of 4.8% from 2015 to 2020. The increasing demand in various applications such as oil & gas, chemical, steel & metal processing, medical care, and food & beverage is the major factor driving the growth of the industrial gas regulators industry. Additionally, with rapid urbanization, growth in infrastructural activities, and increasing industrialization across the globe, there is a rapidly increasing need for industrial gas regulators. The single stage regulators is the fastest-growing segment. This report estimates the size of the industrial gas regulators market in terms of volume (units) and value (USD million). In this report, the market has been segmented broadly on the basis of type, application, gas type, material, and region. The market drivers, restraints, opportunities, and challenges, and product price trends have been discussed in detail. The share of participants in the overall market has also been discussed in detail. This research report categorizes the industrial gas regulators market based on type, application, gas type, material, and region. The industrial gas regulators market size is projected to grow from USD 13,307.7 Million in 2015, to USD 16,862.6 Million by 2020, at a CAGR of 4.8% from 2015 to 2020. The industrial gas regulators industry is increasing proportionally with the overall industrial gas industry. The industrial gas regulators is one where technologies, applications, and industries are constantly changing owing to which exports-imports tend to change as well. The development of economies plays an essential role in increasing the demand for industrial gas regulators in the global market. Industrial gas regulators are devices used for controlling pressure of a fluid or gas in the piping systems. Industrial gas regulators are used to maintain the direction of a fluid or gas flowing through the piping system. Since the past few years, the sector is gaining a slow but steady growth worldwide due to its technical performance and functional properties in the global industrial gas industry. Industrial gas regulator is a special type of product designed for specific applications. The global industrial gas regulator market has grown exponentially in the last few years and this trend is projected to continue. The market is primarily driven by factors such as improving economic condition of countries, technological advancements, and increasing end-use applications. The global industrial gas regulators market is highly competitive with a large number of players all over the world. The major players of the industrial gas regulators industry are Emerson Electric Co. (U.S.), The Linde Group (Germany), Air Liquide S.A. (France), Praxair Inc. (U.S.), and Air Products and Chemicals Inc. (U.S.). These players adopted various strategies to expand their global presence and increase their market shares. Some of the key strategies adopted by the players include new product launches, expansions, acquisitions, and agreements. Figure 52 SWOT Analysis: Praxair Inc. Figure 54 SWOT Analysis: Air Products and Chemicals Inc.